Hello and thank you for visiting my Lybrate profile! I want to let you know that here at 'Advance Physiotherapy And Rehabilitation' me and my staff will do our best to make you comfortable. I strongly believe in ethics; as a health provider being ethical is not just a remembered value, but a strongly observed one. 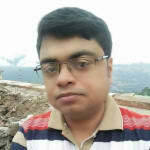 Dr. Prithwish Gozi is a popular Physiotherapist in Rishra, Hooghly. He has over 14 years of experience as a Physiotherapist. He has done BPTh/BPT, MPTh/MPT . You can meet Dr. Prithwish Gozi personally at Advance Physiotherapy And Rehabilitation in Rishra, Hooghly. You can book an instant appointment online with Dr. Prithwish Gozi on Lybrate.com. Find numerous Physiotherapists in India from the comfort of your home on Lybrate.com. You will find Physiotherapists with more than 26 years of experience on Lybrate.com. We will help you find the best Physiotherapists online in Hooghly. View the profile of medical specialists and their reviews from other patients to make an informed decision. Hi doctor, I am 27 yr old working woman. I got injury in my little finger of my right hand during work in lab on 12 of august. I got 5 stitches & minor fracture in my finger. Doctor give me medicine like painkiller paracetamol & one Augmentin & one dose of domperidone for 1 week. After 1 week my stitches was open by doctor. They give me one ointment. My problem is that today I seen that one of that stitch left in my finger. & in last night I suffer from sever pain in my finger. So, what should I do, please advice me. go to doctor to remove stitch and see any pus discharge, there may be infection, got it treated properly, it will help you. I have health anxiety. Minor events lead me to believe that something catastrophic is going to happen. Also insomnia. MEDICATION WILL HELP. IF TAKEN FROM PATANJALI CHIKITSALAYA WILL NOT HAVE SEVERE SIDE EFFECTS LIKE ALLOPATHIC. REGULAR PRACTICE OF ALL THAT IS TAUGHT DAILY ON ASTHA CHANNEL 5.00 TO 7.30 AM. VERY VERY EFFECTIVE- ESP ANULOM-VILOM AND BRAMRI AND UDGIT. YOU WILL GET MIRACULOUS RESULTS FOR FREE AND WITHOUT ADVERSE EFFECTS OF ALLOPATHIC MEDICINES AND WILL GAIN GOOD PHYSICAL AND MENTAL HEALTH, INCREASE IN YOUR STAMINA, GOOD CONCENTRATION, IMPROVED MEMORY, ETC. IT IS EXCELLENT TO DRIVE DEPRESSION , NEGATIVE THINKING OUT OF YOUR SYSTEM. NOT NECESSARY, YOU HAVE TO BE PRESENT IN FRONT OF YOUR TV AT 5 AM. BEGIN BY SWITCHING ON YOUR TV JUST WHATEVER TIME YOU GET UP AND START PRACTICING AS BEING TAUGHT. GRADUALLY WHEN YOU REGULATE YOUR SLEEPING TIME, YOU WILL BE ABLE TO GET UP NEXT MORNING AT 5 AND WILL BE ABLE TO DO COMPLETE WORKOUT. THE TIME YOU SPEND HERE WILL ACTUALLY BE AN INVESTMENT THAT WILL REMOVE TENSION, STRESS, ETC. LEADING TO INCREASED POSITIVITY. Hi, I have got frozen shoulder condition, It was recently a bit twisted while doing some rounds of exercise I have applied several balms but nothing cures it now I am doing slow exercise but still it pains lot while folding during sleep my arms after folding there is pain in shoulder pls advise solution of homemade or natural remedies. My mother age 73, knee (both)pain & swelling foot & knee also for 4 years (approx). YOU DEFINITELY HAVE POSTURE ISSUES IF NOT ANY OTHER DISEASE. visit nearest physiotherapist for pain relief and guidance. DIAL 9820011774 for any assistance. Firstly you have to do physiotherapeutic exercises for your knees. When your thigh muscles are stronger you may not need drugs at all. If your pain is still severe you may take some pain killers and do the exercises regularly to come out of pain. Sir I am suffering from a back pain from 3 year I got all the test normal what should i do, please advice me I should work out in this condition or not? For back pain you can take tablet diclofenac whenever pain increases. 1) Try lying on your side. Place a pillow between your knees to keep your spine in a neutral position and relieve strain on your back. If you need to sleep on your back, slide a pillow under your knees. Be sure to sleep on a comfortably firm mattress. 2) maintain posture-Sit upright, with your shoulders relaxed and your body supported against the back of your chair. Try putting a pillow or a rolled towel between your lower back and your seat. Keep your feet flat on the floor. 3) Physical therapists can teach you how to sit, stand, and move in a way that keeps your spine in proper alignment and alleviates strain on your back. They also can teach you specialized exercises that strengthen the core muscles that support your back. A strong core is one of the best ways to prevent more back pain in the future. In severe conditions surgery is required If a bulging disc is putting pressure on a nerve, your surgeon might recommend a discectomy to remove some disc material. Or a laminectomy might be recommended to decompress an area where there is pressure on the nerves or spinal cord. Spinal fusion may be done to help stabilize the spine. Hi, I am a female 30 years old and recently got a health check up done. According to the reports I have normal T3 (103 ng/dl) and T4 (7.6 ug/dl) levels but my TSH is on a higher side (9.24). What could be the reasons and can it be brought back to normal without medication. Also I have vitamin d deficiency (4.2) could that be the reason? I have a back pain when I wake up early for in the morning and I want to loose my weight. Please give me suggestions. Firstly tk back treatment then start weight reduce. Heat fermentation twice a day and do stretching exercise.